This video provides an overview of the Bill of Materials screen, where you see your project's costs. It also shows the Reports screen and printed labels. The BOM and Reports screen are in all Editions. Printed labels is available in all Editions. CutList Plus will figure out what sizes of stock you need for your project, based on the sizes and prices of your suppliers. It will keep track of how much you have on hand, and how much you need to purchase. You can choose to round up the materials requirements to whole boards or sheets, as in this screen shot. Or, you can pro-rate the materials needed based on the portion of each board or sheet that is actually needed for the project. 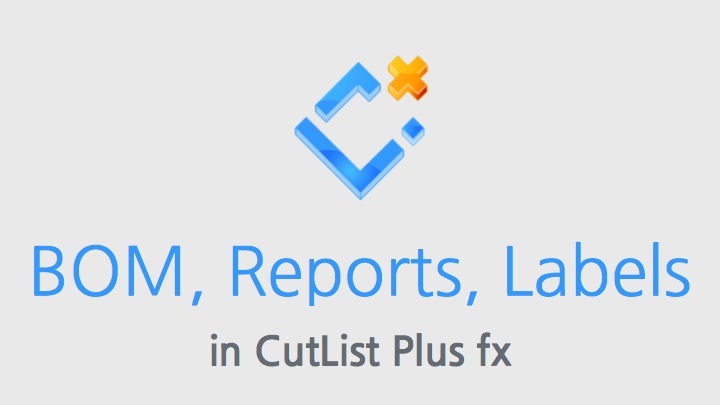 You can also use CutList Plus to track costs for hardware and supplies. These costs are grouped in categories that you define (for example, Hardware and Finishing Supplies).